Recent news from Wisconsin and Ohio show a growing willingness of people to draw together to speak out against what they perceive as injustice and a denial of democracy. The issues are somewhat misrepresented in the larger media siding with the New Republican Governor’s wanting to take away the rights of public employee union members to use collective bargaining. It is alleged that this action is necessary to balance their budget. 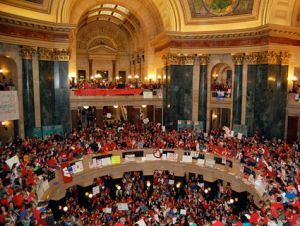 This move by state Republicans in Wisconsin and Ohio calls into question the validity of unions. Unions over the last century have performed a necessary function of advocating for workers rights including their right to share in the prosperity created by their labor. Since Ronald Reagan we have seen a decline in union membership in the private sector and now it seems there is an outright attack on public employee unions. Regardless of how you might feel about the issue or the actions of the Governor, the legislature, or public employees you have to take note of how this issue signals the fact that our system of governance appears to be breaking down. I believe we have seen our electoral process taken over by powerful moneyed interests that give us policy makers who represent the narrow interests of those who paid for the election. This is in part due to the changes resulting from the Supreme Court ‘Citizen’s United” decision to allow Corporations to enter into funding of campaigns at all levels. It also has to do to with what has been happening to our democracy over the last 30 years. Policy makers for whatever reason have gradually created a country where those with the most money can influence government to protect their interests. 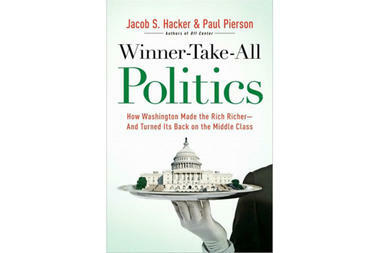 Jacob S. Hacker in his recent book Winner Take All Politics does a good job explaining how this came about. I highly recommend it. It is true, I believe in economics and in our community life together and we are a better society we keep this notion in mind. I am a former member of the Minnesota House of Representatives, District 20B (Northfield, Dundas, Lonsdale, Montgomery and surrounding townships.) I worked to create jobs, make taxes fair, protect our schools, expand access to affordable health care, and protect our environment. "We all do better when we all do better." Past Blog Posts by Category. For where David stands on current issues, please see the Issues page. Starting Line: Are some Minnesotans leaving the state due to high taxes?